On December 11, 2014, tenured and tenure-track faculty members of the Tufts University School of Medicine (TUSM) filed a petition to the National Labor Relations Board (NLRB) to hold on-campus union elections. If this election is allowed by NLRB, then the 70 members of the TUSM faculty will join the ranks of their Medford colleagues in the Faculty Forward union at Tufts, a division of the Service Employees’ International Union (SEIU) Local 509 (1). As mentioned, this is not the first time Tufts-affiliated faculty have filed for unionizing. 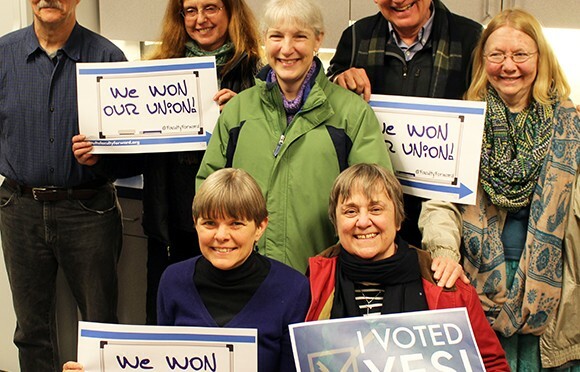 In February 2015, majority of the Medford/Somerville campus faculty had voted in favor of unionizing in an effort to improve working conditions (2). And even before that in 2014, adjunct faculty members on the Medford campus, rallying under the Adjunct Action division of SEIU, negotiated a significant raise in their pay (3) that is set to be completely in effect by September 2016 (4). The TUSM faculty appears to be motivated for similar reasons; in a joint email to Tufts Daily, Dr. Karina Meiri, Professor of Developmental, Chemical & Molecular Biology (DMCB), and Dr. Henry Wortis, Professor of Integrated Physiology & Pathobiology (IPP), mentioned issues regarding salary and research funding as major sources of motivation. They elaborated in the letter that while faculty members are trying to get funding in an increasingly competitive environment with diminishing sources, the university is putting on additional pressure on them by providing “negative incentives”. Drs. Meiri and Wortis mentioned, “If faculty were unsuccessful, [in their application] as they were pretty much bound to be, given the odds, their salaries would immediately be cut, often by very significant amounts.” They also pointed out that many faculty felt that their ability to speak their minds on administrative decisions was being limited. Drs. Meiri and Wortis believe that through unionization, financial transparency and partial restoration of decision-making ability, job security and stability can be achieved for the faculty. To quote, “Our strong belief is that the educators and researchers at a university need to be deeply involved in decisions that shape its mission and that unionization will provide a path towards…the return of collegiality”. It seems that majority of the TUSM faculty are in favor of unionizing, as almost 60% of them had voted in favor of holding on-campus elections. The ones who did not vote, either did not do so because they do not want a union or they do not feel strongly enough for the need of one, as Drs. Meiri & Wortis explained in their letter. Currently, the TUSM faculty waits on the NLRB’s decision on whether they will be allowed to hold elections or not. Regardless of this decision, the fact that this has become a trend across universities, institutions founded on principles of non-profit due to their increasing profiteering nature, is a great cause of concern indeed. Drs. Meiri & Wortis’ quotes have been reproduced from their letter to Tufts Daily with their permission. The Tufts Daily article was published on Jan 29, 2016, and can be found here.